Wyeast Liquid Yeast Packs are pure liquid yeast strains for brewing a wide array of your favorite beer,wine, mead and cider. Using them is an effective way to improve the quality of your homebrew and is essential for "cloning" many styles of Ales, Lagers and Wheat beers. Wyeast Activator packs contain so many yeast cells they can be used straight out of the package without making a yeast starter. Unlike any other pitchable on the market, The Activator is the only one that comes in a double foil bag called a "smack pack." When activated the inner foil pouch breaks open and releases nutrients that start the yeast working. You will see the pack start to swell within hours providing proof of life before you pitch it into your wort! That is peace of mind any brewer will appreciate. 100 billion cells of pure liquid yeast. No need for a yeast starter. The only package that provides essential fatty acids and micro nutrients for a healthy and complete fermentation. 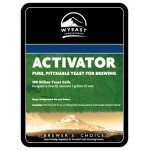 When activated, yeast metabolism begins, providing proof of viable active yeast ready for brewing. LAST CHANCE - 1 Left Wyeast Private Collection ~ Wintery Mix Available January, February and March..
LAST CHANCE - Only 3 Left Wyeast Private Collection ~ Wintery Mix Available January, February,&nbs..
Wyeast Private Collection ~ Rustic Spring Available April, May & June 2019 ​Limite..
Wyeast Private Collection ~ Rustic Spring Available April, May and June 2019 ​Limited pr..
A true top cropping yeast with low ester formation and a broad temperature range. Fermentation at h..
A strong fermenting, true top cropping yeast that produces a dry, slightly tart, crisp beer. Ideal f..
A rich mineral profile that is bold and crisp with some fruitiness. Often used for higher gravity al..
Used commercially for classic American ales. Ferments dry, finishes soft and smooth. Very clean, cri.. This versatile yeast ferments extremely well in dark worts. Clean, smooth, soft, and full-bodied, Sl.. This yeast allows malt and hop character to dominate the profile. It ferments dry and crisp, produci..
A mildly malty and slightly fruity fermentation profile. It is less tart and dry than Wyeast 1098 Br..
With many of the best qualities that brewers look for when brewing American styles of beer, this st.. This strain produces classic British bitters with a rich, complex flavor profile. The yeast has a li.. Originating from a traditional London brewery, this yeast has a wonderful malt and hop profile. It i..
One of the classic ale strains from a Northwest U.S. Brewery. It produces a malty and mildly fruity .. The classic choice for brewing golden strong ales. This alcohol tolerant strain will produce a compl.. This terrific all-round yeast can be used for almost any beer style, and is a mainstay of one of our.. This strain produces ales with a full chewy malt flavor and character, but finishes dry, producing f..
Our Scottish ale strain is ideally suited for the strong, malty ales of Scotland. This strain is ver..
An excellent yeast strain for use in Belgian dark strong ales. This strain has a relatively “clean p..
A very good cask conditioned ale strain, this extremely flocculant yeast produces distinctly malty b..
Wyeast 2007 is the classic American lager strain. This mild, neutral strain produces beers with a ni.. This strain is particularly well suited for producing California Common-style beers. It retains lage.. This Carlsberg type yeast is the most widely used lager strain in the world. This strain produces a ..
Used by many German breweries to produce rich, full-bodied, malty beers, this strain is a good choic.. Originating from the home of great Pilsners in the Czech Republic, this classic strain will finish d.. This is a unique strain, capable of producing fine lagers. It is very smooth, well-rounded and full-.. This strain is a classic, true top cropping yeast strain from a traditional brewery in Cologne, Germ.. This blend of lager strains is designed to produce a rich, malty, complex and full bodied Octoberfes.. This proprietary blend of a top-fermenting neutral ale strain and a Bavarian wheat strain is a great.. The classic and most popular German wheat beer strain used worldwide. This yeast strain produces a b.. This blend contains yeast and bacteria cultures important to the production of spontaneously ferment..
A complex alternative to the standard German wheat strain profile. This strain produces apple, pear,..
A very versatile strain that produces Saison or farmhouse style beers as well as other Belgian style.. This strain is the classic farmhouse ale yeast. A traditional yeast that is spicy with complex aroma..
Wyeast 3726 Farmhouse Ale Yeast. This strain produces complex esters balanced with earthy..
A classic strain for brewing Belgian dubbel or Belgian tripel. This Abbey strain produces a nice bal.. This versatile witbier yeast strain can be used in a variety of Belgian style ales. This strain prod..